WordPress website builders make it easy to build websites without code using drag-and-drop or point-and-click editors. We reviewed over 20 of the top WordPress website builders and chose the six best—including the best overall—based on price, ease of use, customization options, integrations, the use of clean code, and customer support. Before your website can go live, you will need to find a reliable WordPress web hosting provider. We recommend Bluehost. Not only is it affordable—plans start at $2.95 per month—but it boasts a 99.9% uptime and is packed with features and extras, such as a free domain name, free email, and more. Get started with Bluehost today. Visual Composer (Best overall) Businesses that want a highly-ranked WordPress website builder with comprehensive features. Thrive Architect Businesses looking for a builder with extensive built-in marketing tools. Brizy Those with zero technical abilities looking for an ultra easy-to-use builder. Elementor Ecommerce businesses that need a website builder with integrated WooCommerce features. Beaver Builder Businesses seeking unlimited site licenses for one flat fee. King Composer Teams with varying tech abilities needing both visual and code-based building functionality. 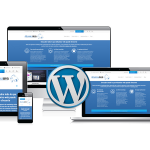 WordPress website builders, which are most often designed as plugins, were created to give non-tech-savvy users an easy way to build professional-quality WordPress websites without any code or technical expertise. With so many to choose from, we sought out the best ones that cost less than $100, are easy to use, include many third-party app integrations, have clean code, and offer customer support. Price: To be considered affordable, builder plugins could not cost more than $100 for their entry-level plans, with a preference for those that offer quality free versions in addition to paid premium plans. Ease of use: The reason for using a builder plugin is to make it easy to build a WordPress website without web development experience, so we ranked plugins that are very straightforward and intuitive. WordPress theme compatibility: Some WordPress website builder plugins are designed to work with only specific WordPress themes. We avoided those plugins and, instead, included those that have universal WordPress theme compatibility. Editing interface: While usability of site builders is important, having a wide range of customization options with a variety of prebuilt content modules and mobile-responsive layouts is key. This was a core consideration in our ranking. WordPress integrations: Integrations with third-party tools and plugins give you the power to create a site that meets all of your business needs, so we looked for builders that include multiple integrations. Clean code: Website builders use back-end code to implement user design changes. If the code is dependent on a site builder to work, deletion of that builder could cause site damage. That’s why we only considered builders that use “clean code,” or code that is not dependent on a specific site builder. Customer support: Support is not necessarily standard with plugins, but to make our list, quality support at no additional fee was required. Based on the criteria above, the best overall WordPress website builder is Visual Composer. It stands out for its intuitive, drag-and-drop interface and extensive customization options—all available in the free version. Plus, it’s highly ranked on mainstream plugin sites like CodeCanyon and review sites like G2 Crowd. This makes it a great value for small businesses that need to get a WordPress website off the ground quickly. 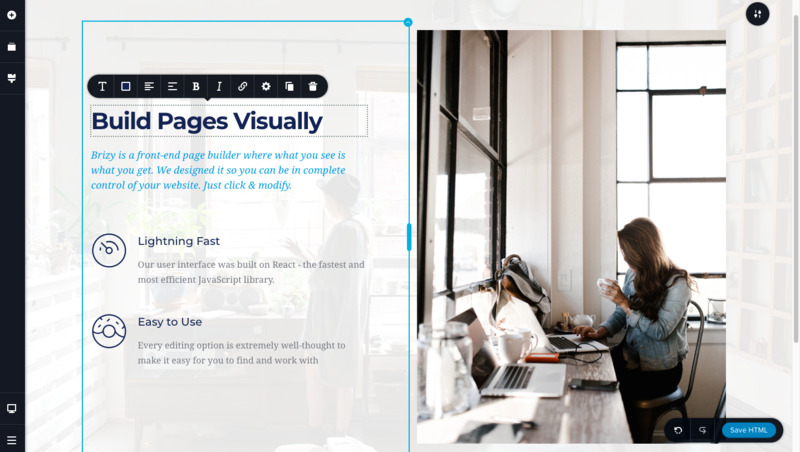 Visual Composer is a WordPress website builder plugin that stands out for its usability and comprehensive customization options—both as part of the free version. What’s more, it has received a 4.6-star rating on both CodeCanyon and G2 Crowd. It’s best for businesses seeking a free, easy, and comprehensive way to build professional business websites quickly—and grow their sites using the same builder. Visual Composer has free and paid premium versions. Both versions give users access to its user-friendly, drag-and-drop editor; this can be used to build a custom WordPress site without any code. The free plan includes over 50 site themes and content modules. The premium plans give users further customization and functionality options for $59. The Free version of Visual Composer gives users access to the easy-to-use, drag-and-drop interface, as well as over 50 themes and content modules—minus ecommerce modules. This gives users a good starting point for building and customizing a website to suit their needs. Visual Composer is compatible with all official WordPress themes and plugins, so the opportunities for functionality are nearly endless. The free version of Visual Composer is best for small businesses and startups looking for a cheap way to build a professional website that does not sell products or accept payments. Those building ecommerce sites will find the premium version to be a better option. Online store builders should also consider Elementor’s Personal plan, which includes WooCommerce functionality and support. The Premium version of Visual Composer costs $59 for one website. 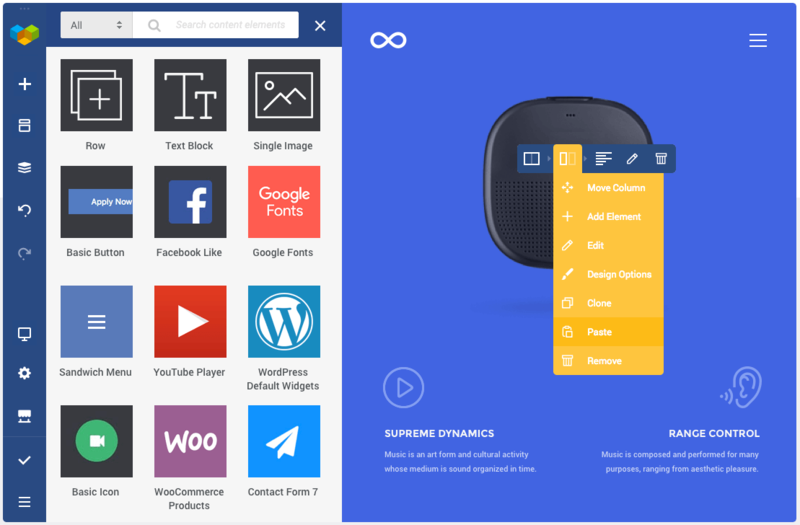 It gives users access to the same drag-and-drop editing interface, plus hundreds of additional premium content elements for more design and layout options, premium templates, the ability to import and export templates, customization options for headers, footers, and sidebars, and WooCommerce support. Given the inclusion of WooCommerce functionality and support, the premium version of Visual Composer is best for robust ecommerce businesses. A cheaper option for building an ecommerce site or online store is Elementor, which offers an intuitive interface and WooCommerce features and support for just $49 per year. Visual Composer is renowned for being a very easy-to-use WordPress website builder. It has a simple and intuitive drag-and-drop editing interface that gives those without any coding knowledge the ability to design a professional-quality website in very little time. Customer support for those using the free version of Visual Composer is available via a comprehensive help center. This serves as a question-and-answer database that users can use to troubleshoot at home. Premium users get access to the help center as well as an online ticketing support system. Visual Composer does not render 100% clean code. This can cause some formatting issues if you remove the builder, but the changes won’t be terribly significant. Many builders create “dirty code”—causing websites to crash when the builder is removed—so Visual Composer is actually at the top end of site builders for clean code usage. Visual Composer has a 4.6 out of 5-star rating on G2 Crowd. Many users consider it the best WordPress website builder and like how it gives them an easy way to quickly build a WordPress site with zero coding. Negative reviews note the builder can slow down websites and that there is no easy way to undo changes to page designs. Learn more about Visual Composer by visiting their website. On the homepage, click the “Free version” or “Go premium” buttons to learn more about Visual Composer’s features. When you’re ready, you can either download the plugin or register for premium add-ons. 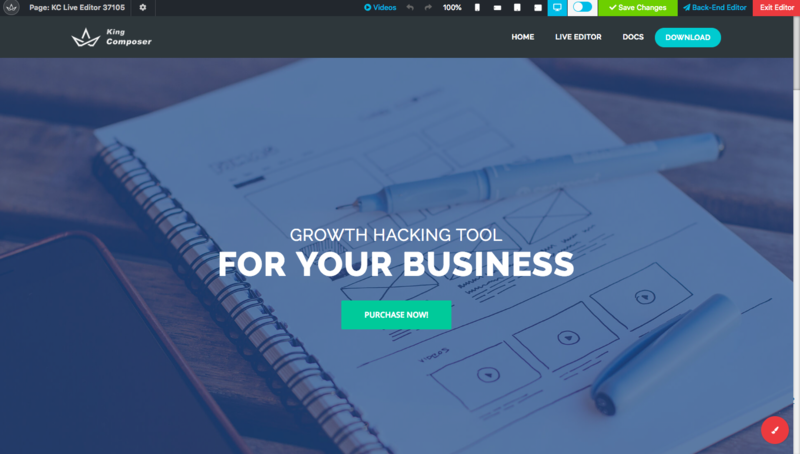 Thrive Architect is a WordPress website builder that boasts an impressive number of marketing tool integrations—all for a one-time fee of $67. Its many marketing integrations—including Mailchimp, Active Campaign, and more—maximize a website’s ability to serve as a marketing tool. It’s best for businesses that want to turn their branded site into a marketing hub for generating leads and building brand awareness. Thrive Architect has a one-time fee of $67 that gives users indefinite use of the builder on a single site. It includes a very intuitive editing interface, nearly 300 landing page templates, and hundreds of fonts, effects, and styling options. It is notably low-cost compared to most builders that charge on an annual basis. Thrive Architect is regarded as one of the best WordPress website builders given its low cost, ease of use, and vast customization capabilities. Its drag-and-drop front-end editing interface is intuitive, it is mobile-responsive, uses clean code, includes free customer support, and offers many great third-party integrations such as Mailchimp for email marketing. Thrive Architect has an intuitive front-end drag-and-drop interface. When opened, Thrive replaces the native WordPress screen with its own editing interface. This eliminates confusion between WordPress menu options and the builder’s own site creation tools. A sidebar on the left-hand side of the screen showcases content modules which can be easily dragged onto a page and edited with a single click. Changes can be seen live on the screen as they are made. Thrive Architect is compatible with all WordPress themes and even comes with more than 100 themes for new site builders. Thrive also includes over 30 integrations, many of which are designed for marketing—including lead generation forms, call-to-action buttons, email sign-up forms, and more. Some of the more popular email marketing integrations include Mailchimp, AWeber, Constant Contact, GetResponse, and HubSpot. Thrive Architect uses nearly 100% clean code. If you choose to delete the builder, you will notice some minor formatting issues, such as spacing changes, but nothing that will cause major site malfunction. Overall, Thrive Architect is a very clean WordPress builder plugin. It’s simple to install, set up, and use, and is particularly helpful to users who are not familiar with either WordPress or site building in general. While there are many integrations available to Thrive Architect users, there are not as many as available through Visual Composer, which makes the editing interface less cluttered. The one-time, single site license for $67 gives users one year of unlimited support. This support is available via an online ticket system. Thrive also offers a knowledge base that serves as its help center; here, users can search for and find answers to many commonly asked questions and troubleshoot issues on their own. Thrive Architect is missing a free plan. Many other WordPress website builder plugins offer users a free, “light” version that provides basic customization features. This allows users to build a simple website that does not need premium features, or it gives them the opportunity to get a good feel for the plugin before committing to a purchase of the premium version. Those looking for a free plan with robust features should consider Visual Composer, Brizy, or Elementor. Thrive Architect has a 4.5 out of 5-star rating from AThemes. It is a popular WordPress website builder and regarded as very easy to use with a simple live editor that shows you how your site will look as you create it. On the other hand, it’s not the cheapest WordPress website builder available, so it’s not the best choice for those working with a tight budget. Visit Thrive Architect online to learn more about its capabilities and if it’s a good fit for your WordPress site building needs. From the home screen, click the orange “Yes, I Want to Build Better Content and Landing Pages” button to start building your marketing-optimized website with no code. Brizy is a relatively new WordPress website builder that is noted for being very easy to use. At the moment, it only offers a free version, but this includes an extremely intuitive editor, over 100 content modules, and robust customer service. Those with absolutely no web design experience should seriously consider the easy-to-use Brizy as their choice for WordPress site building. Brizy currently only offers a free version, though it has plans to roll out low-cost premium plans in the near future starting at $49 per year. The free version gives users access to its easy-to-use, drag-and-drop interface for one website with a number of customization options that can be used with any WordPress theme. Brizy’s free version comes standard with a great deal of customization options. Plus, editing is extremely intuitive with the drag-and-drop editor that requires zero coding knowledge. It can only be used to build one website, but it gives users access to over 150 prebuilt content blocks, global styling tools, and a handy auto-save feature so your changes will never be lost. Given the cost and ease of use, Brizy is the best WordPress website builder for businesses with no budget for website design and no experience with site creation. A similar free option is Visual Composer, which is more widely used by site builders than Brizy. Currently, the Brizy Pro versions (Personal and Unlimited) are not available. Brizy has plans to release these premium versions in the future, which will give users premium designs, A/B testing capabilities, a pop-up builder for lead capture, and third-party integrations. It also includes a Role Manager for web design companies managing clients. When Brizy Pro and Ultimate plans become available, they will be ideal for web designers, largely because of its Role Manager feature and white label options. For now, those interested in building a marketing-optimized site on behalf of clients should consider Thrive Architect, which comes standard with dozens of website marketing integrations. Brizy’s claim to fame is its ease of use. The drag-and-drop editing interface was created with a clean, minimalist design to ensure maximum usability. Plus, with more than 150 content blocks—from text boxes to testimonials and pricing tables—Brizy allows users to easily drag prebuilt content types onto site pages for efficient site building. To edit individual content blocks on a page, simply click on them to reveal text or image editing options. Brizy’s customer service is available via live chat and Facebook Messenger. It doesn’t currently offer support by telephone. However, the builder has a large community of active users that can help answer questions and troubleshoot issues via the Brizy forum. Brizy’s code is not 100% clean; if you choose to delete the builder, you will likely notice some formatting issues on your site, though nothing that will damage site integrity. If you want to ensure your site uses clean shortcode, consider Beaver Builder instead. Another thing Brizy is missing is customer support via phone. Instead, it is only available via live chat, which can present a problem for users requiring immediate assistance. Brizy has an overall 4.4 out of 5-star rating on WordPress Reviews. Reviewers frequently note that Brizy is the best free alternative to paid WordPress website builders such as Elementor. Users like how fast they can build a site using Brizy given its easy styling and prebuilt blocks. Negative reviews mention that the responsive builder can be buggy and some users had issues with images loading correctly. Go to Brizy’s website to learn more about the plugin’s features and capabilities. You can download the plugin from the website directly by clicking the “Free Download” button in the upper right-hand corner of the screen. Alternatively, go to the WordPress plugin page to download it and start building your WordPress website in no time for free. Elementor is a leading WordPress site builder celebrated for its ecommerce integrations. Most notably, it includes WooCommerce integration alongside marketing integrations such as Mailchimp and ActiveCampaign—all available with the $49 premium version. Given these standout features, Elementor is best for companies that want to easily build out their own online store. Elementor WordPress website builder offers both free and paid plans. The premium plans start at $49 for one license and go up to $99 for unlimited licenses. The free plan includes the easy-to-use, drag-and-drop editing interface that is compatible with any WordPress theme or plugin, 30 basic widgets, and more. Elementor’s Free version includes a fully functional drag-and-drop interface and comes with a theme library to get users started. It’s also compatible with all WordPress themes and plugins and offers 30 content widgets, giving users broad customization options. It utilizes clean code, so your site will remain intact if you choose to leave Elementor. The downside is that it doesn’t include support or ecommerce integration. The Free version of Elementor is ideal for those who want to test out the builder interface before committing to the paid version—or those who just need an informational website. Those who want a free plan with more customization capabilities should consider Brizy or Visual Composer. The Personal plan costs $49 per year for one license and gives users additional themes, widgets, and tools, such as the pop-up builder and WooCommerce integration. This gives users the ability to easily create an ecommerce site using WooCommerce for a low cost. The Personal plan also gives users customer support for one year, which is not included in the free version. 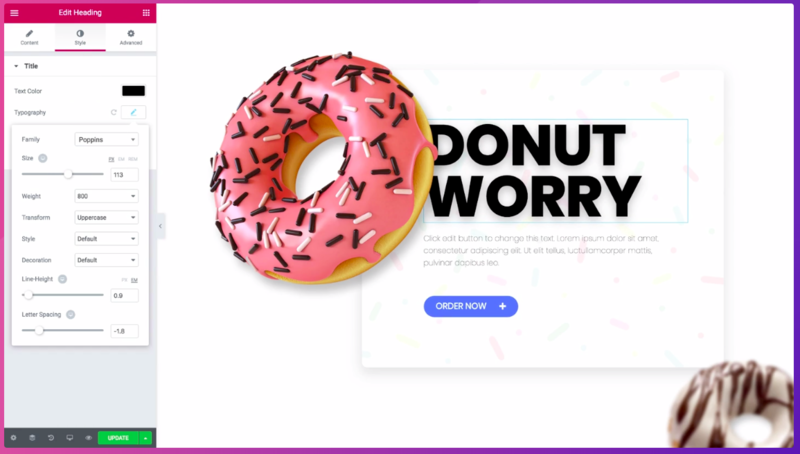 With WooCommerce and email platform integrations, the Personal plan is best for single-brand companies that want to make the most of an online store and marketing campaigns. Those who need to build more than one site should consider Beaver Builder’s plans with unlimited licenses. Elementor’s Business plan includes the same features as the premium Personal plan, but with three licenses instead of one. This gives businesses building three or fewer websites a good value. The Business plan is good for franchise businesses or those that have three or fewer brands, each with their own website. Those that need more than three licenses, such as web development services businesses, can get unlimited licenses more affordably with Beaver Builder for $99 per year. Elementor is an intuitive drag-and-drop page builder. There are hundreds of free themes available that can be fully customized in the live visual editor. The builder will show you in real-time what your website will look like as you make changes to it. Elementor’s visual editor lets you customize every aspect of your site, from fonts and layouts to your header and footer. Some may find the extensive customization options to be overwhelming, however. Customer support is available 24/7 via a support ticket system, though this is only available to those on premium plans. Businesses using the Free version of Elementor are limited to support forums where they can search for topics and use help articles to troubleshoot issues on their own. Elementor is missing customer support for free users. Those who want customer service available with a free plan should consider Brizy, which offers free support via live chat to all of its users. Elementor is also missing a low-cost plan that includes unlimited licenses. Elementor has a very high average rating of 4.8 out of 5 stars on WordPress Reviews. Reviewers often comment that they like how easy it is to build a WordPress website using Elementor and that while the Free version is great, the premium versions are a good value for the money. Negative reviews note that the lack of customer service for the Free version is an issue. Visit Elementor’s website to learn more about its features and capabilities. You can also check it out on WordPress by searching for it on the plugins page. From there, you can read real user reviews and download it directly to your site. Try Elementor risk-free with its 30-day money back guarantee. Beaver Builder is a free and paid WordPress website builder with no license restrictions—a standout feature among the builders on our list. It also boasts an intuitive drag-and-drop editing interface and limited integrations. With no limit to the number of sites that can be built with Beaver Builder, it is likely the best site builder for businesses designing numerous websites, such as web design and marketing firms with many clients. Beaver Builder offers a free Lite plan and a $99 per month Pro plan. The free plan includes unlimited licenses, but offers only limited integrations. The Pro plan, however, includes premium support, more than 75 integrations, and WooCommerce support. Beaver Builder Lite is the free version that offers only limited capabilities. However, it does include the simple drag-and-drop builder that is compatible with most WordPress templates and licenses for unlimited websites. The downside is that it only includes five customizable modules: audio, HTML, text, photo, and video. There’s also only basic support available via its help center. Given the content limitations, this plan probably isn’t good for businesses that are interested in creating robust websites. Instead, the Lite plans best serves non-tech-savvy bloggers or freelancers experimenting with multiple site designs at once. Those who don’t plan to build multiple sites and want a free site builder will find other builders, such as Visual Composer and Brizy, to be a better fit with more comprehensive features at the free level. Beaver Builder Pro costs $99 per month and, like the Lite plan, includes an unlimited number of licenses. It also includes more than 75 integrations, prebuilt content blocks, and prebuilt landing pages. Additional support via an online ticketing system helps site owners troubleshoot problems quickly. With extensive customization options and unlimited licenses, the Pro plan is best for businesses building multiple websites, such as web design companies or businesses managing sites for multiple brands. If ecommerce functionality is important, then businesses should consider Elementor instead, which offers WooCommerce integration and online store tools for $49 per year. Beaver Builder utilizes a simple, front-end drag-and-drop editor. Depending on whether you’re using the Lite (free) or Pro (paid) version, you will have the ability to customize a number of modules from text and photos to forms and slideshows. The editor shows you in real-time how your site will appear with your changes, allowing you to edit more efficiently. Customer service is limited to those on a premium paid plan. Those using the free version of Beaver Builder have access to forum-style help from fellow Beaver Builder users. With a community of over 6,000 members, it’s typically easy to find answers, though this isn’t the best for those who prefer one-on-one customer service assistance. Beaver Builder is missing basic integrations and customization options in the free version. This is extremely limiting, especially compared to other WordPress website builders, such as Visual Composer and Brizy. It’s also lacking customer service with the free version, which can be troublesome for users who often have design or technical questions. Beaver Builder has an average 4.8 out of 5-star rating from nearly 300 reviewers on WordPress. Reviewers frequently comment how they feel Beaver Builder is the best WordPress site builder available, and how helpful the support community is. Negative reviews note that the Lite version has limited customization capabilities, such as no ability to customize the header and footer. If you want to learn more about Beaver Builder or are ready to purchase the Pro version, go to the Beaver Builder website. Alternatively, the free Lite version can be downloaded directly from WordPress. Try the Pro version risk-free with its 30-day money back guarantee. King Composer is a WordPress website builder that includes both visual front-end and code-based back-end editing interfaces. Including both allows teams with varying levels of web development expertise to work together collectively for just $39. With this versatility, it’s best for teams with varying technical skills working together on the design of a single site. King Composer is free for back-end editing only. To add front-end editing capabilities, you will need to upgrade to a premium plan, which starts at $39 per year. 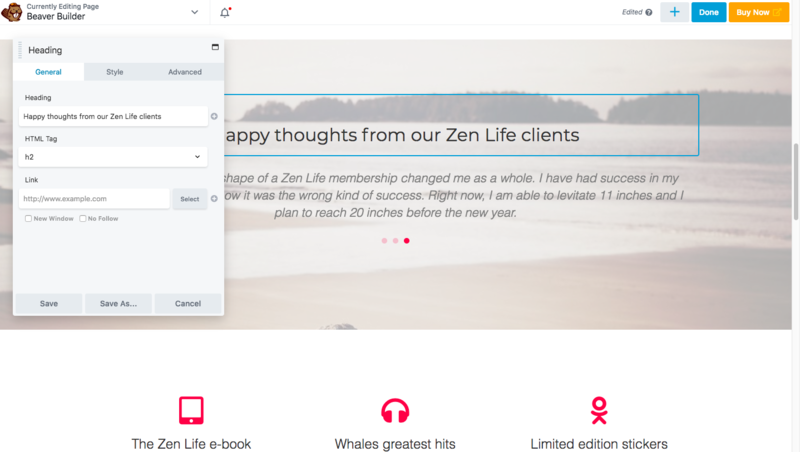 The entry-level premium plan gives users access to its easy drag-and-drop editing interface for one site, is compatible with most WordPress themes, and includes 24/7 customer support. The King Composer’s Free version includes a back-end-only editor. This means that users will not have access to a live drag-and-drop-style interface, making it difficult for those without web development knowledge to create a professional website. It includes a license for one website and is compatible with any WordPress theme. This free version is not a good option for businesses looking for an easy-to-use WordPress builder, as it doesn’t include a visual, front-end editing interface. Those looking for a free WordPress website builder with a more intuitive editor should consider Elementor or Brizy. The King Composer Individual plan costs $39 per year for the use of its front-end and back-end live editors for one website. It is designed to build responsive-ready sites that are optimized for fast load times. It includes dozens of templates, content blocks, and prebuilt landing pages, as well as one month of 24/7 customer support. This plan, featuring front-end and back-end editing, is ideal for small businesses that work collaboratively and have one or two experienced designers on staff, such as young marketing companies or early-stage web design firms. Unlike free builders, King Composer lets you build a site with both its drag-and-drop interface as well as with coding, which emphasizes collaboration for teams with varying levels of technical expertise. The Professional plan costs $99 and gives users all of the features from the Individual plan, such access to the front-end and back-end live editors, templates, prebuilt landing pages, and two months of 24/7 customer support. The main difference between the Individual plan and the Professional plan is that this plan gives users licenses for up to 10 sites. With an upgrade to 10 licenses, the Professional plan is ideal for collaborative teams that work on multiple branded websites. It’s unlikely these would be clients; rather, these sites would serve franchise-based companies or businesses with multiple brands. King Composer has a very easy-to-use front-end and back-end editing interface. It utilizes a very clean and minimalist interface that reduces clutter. To edit the site on the front-end, simply click on a content block, such as a text box or image, to begin editing it. To edit on the back-end, click on content boxes to edit or reorder; add new ones by clicking the “+” at the bottom of each section. 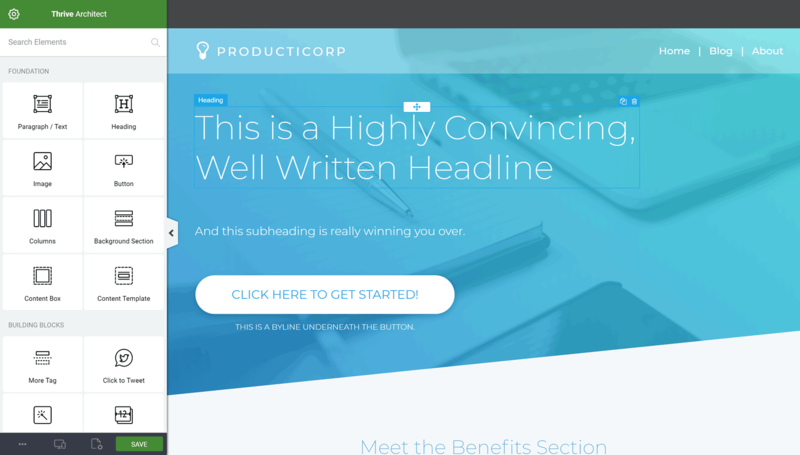 Edits are shown in real-time, so you see what your site will look like as your build it. King Composer customer service is available with its premium plans. Premium customer service is available 24/7 via a support ticket system that promises turnaround times within 12 hours. However, this support is only offered for a limited time—between one and two months, depending on the plan. Those on the free plan will be limited to forum-style support with fellow King Composer users, where they can find resources to troubleshoot issues on their own. King Composer is missing a free front-end editing interface. If you want a front-end drag-and-drop interface, you will need to upgrade to a paid plan. Also, premium users get access to customer support for only a limited period of time. Those who want customer service available year-round should consider Thrive Architect or Brizy. King Composer has an average 4.6 out of 5-star rating from reviewers on WordPress. Reviewers frequently comment that they like how simple King Composer’s editing interface is, that it is very fast, and that it includes many options like the ability to customize fonts. On the other hand, negative reviewers commented that the plugin doesn’t update enough and that there’s a lack of customer service. Learn more about King Composer by visiting them online. From the product homepage, click on “Features and Pricing” to get plan-specific information. Start using King Composer today by trying the demo or beginning your free seven-day trial. The best WordPress website builders make it easy to build a beautiful and functional WordPress website without any code or technical experience. The best WordPress website builder for you will depend on your business needs, but should cost less than $100, offer multiple third-party integrations, be easy to use, and add only clean code to your site. 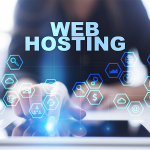 Before you can begin building your site, you need to find a secure, reliable web host. It can be a challenge finding one that suits your needs, but we recommend Bluehost as the best option for most small businesses. They offer web hosting with near 100% uptime, a free domain, five email addresses, and more—all for $2.95 per month. Click here to get started.